Atomos Sumo first production monitor that also records 4K 12bit Raw, 10bit ProRes/DNxHR, plus 1080p60 live switching and recording. Get HDR on set in real-time with on the fly Log to HDR and PQ/HLG playback complete with mission critical scopes such as waveform, focus peaking, false color and vectorscope on the calibrated screen. Beyond monitoring, with up to 4Kp60 and 2Kp240 recording you can generate instant dailies and proxies direct to affordable and available SSD media. 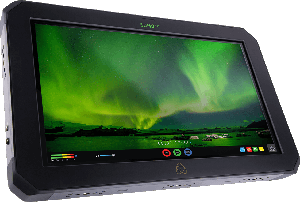 Atomos Sumo combined monitor-recorder in the larger 19" size gives focus pullers instant on set access to footage with focus peaking, 2:1/1:1 zoom and the ability to tag footage as XML files. The high bright 1200nit monitor, sturdy built-in armor aluminium alloy design and variety of mounting options makes it a go-anywhere, do-it-all monitor-recorder for focus pullers. Clients and directors can see the amazing true-to-life nature of HDR in real-time away from the camera crew with precision mapping of Log from every camera maker and playback of PQ/HLG signals. Full playback controls and XML tagging means that they can also review footage and even create an instant client lightweight ProRes LT copy with baked in LUTs and audio onto affordable SSD media. You can also choose to view both Log and standard gamma images with or without LUTs applied. Toggle between different looks with ease in seconds. Sumo Aluminium alloy chassis with built-in armor houses ten mounting points around the top/bottom/side, a rear panel VESA mount and an included stand for a variety of mounting configurations. Alongside of the XLR connections for power and balanced audio, there is a 3.5mm stereo headphone jack and built-in speakers. Sumo optional mounting plates connect dual V-Lock or Anton Bauer batteries work in tandem with our patent pending continuous power system. This allows batteries to be hot swapped to ensure you are never without power in the field. Seamlessly connect any SDI or HDMI device and convert between HDMI 2.0 and SDI (3G QuadLink / 6G / 12G) in any combination. Quad SDI inputs connect cameras with multiple 1.5 or 3G SDI outputs without the need for converters. HDMI 2.0 supports up to 4Kp60 input/output along with the very latest Atomos open protocol that supports HDR automation including importing of camera settings. There is also support for Genlock and LTC timecode. Capture the RAW output from Sony FS5 / FS7 / FS700, Canon C300MKII / C500 or Panasonic Varicam LT over SDI up to 12-bit 4Kp30 as CDNG or 10-bit Apple ProRes / Avid DNxHR up to 4Kp60 / 2Kp240 depending on the camera&apos;s capability. The processing power of Sumo preserves pristine quality direct from the sensor with data rates of up to 3.2 Gbps. Make working with multi-cam a breeze. Switch and mix a live record and stream or record 4 x HD ISO recordings using the Quad-Link SDI connections. Switch between feeds on screen with cueing, cross fade and hard cuts from the locked sources or tag and adjust final edits with advanced metadata tagging preserving ISO feeds, with the desired final result infinitely editable. The extremely bright 1200nit display means you can accurately monitor, even when outside in full daylight. Additionally, for the ultimate low light performance an optional hood is available. The simplicity of AtomOS means its only a single tap on screen to bring up focus peaking, 2:1/1:1 zoom, Zebra, False Color, Frame guides, SMPTE Safe Area, Waveform, RGB parade, Vector-scope, Anamorphic desqueeze and a flexible 3D LUT implementation to upload your own LUTs as .cube files. The first shipment for Atomos Sumo is scheduled to arrive here in Singapore during Beg Jul 2017. I have a chance to look at and manner around with this toy at Atomos seminar recently. The first impression was, this monitor/recorder is apparently the blown out of Inferno but with more stuff in it .However my attention was just to focus on it monitor capabilities , though it offers you a 4 x HD stream 1 x 4k Quad link recording and a 4 channel switcher. To convince me whether it was a good buy, it is simple, is it worth to buy this 19 inch Monitor with HDR at USD 2495? I have look around too whether I could get the similar monitor at the price range less than USD 3000. The answer is Nope. The Sony HD monitor LMD-A170 is currently selling at USD 2599 but it does not have HDR feature. So What I conclusion have I drawn?... It is good value for money to get Sumo as monitor for sure. With optional purchase you can gear it up with sun hood and 2 x battery operated monitor and Atomos is currently designing a rack mount kit for it. I am considering to use is at grading and editing monitor, although not the best , at this price point nothing to complaint. metal material around it with weight for just less than 6kg. It is scheduled to have its first Shipment out from factory by End of Jun 2017. The Screen interface work the same way as its Inferno recorder. Now I would like to look at the bonus features , 4 stream HD recording ( or 1 x 4K ) and switcher function . it seems that 4 x HD recorder perform like Convergent designed - Apollo, however the switching function and limited switching effect may render it less than a perfect switcher and it records 4 channel instead of 5 ,unlike Apollo ( 5 recording stream including program out) . So like I have suggested, just get it as a 19 inch HDR monitor, the deal is now becoming sweeter by having a 3 years warranty if you registered your purchase online with Atomos. Accordingly the first shipment is going to take place by End of Jun 2017.